Bacteria are single celled microbes. The cell structure is simpler than that of other organisms as there is no nucleus or membrane bound organelles. Instead their control centre containing the genetic information is contained in a single loop of DNA. Some bacteria have an extra circle of genetic material called a plasmid. 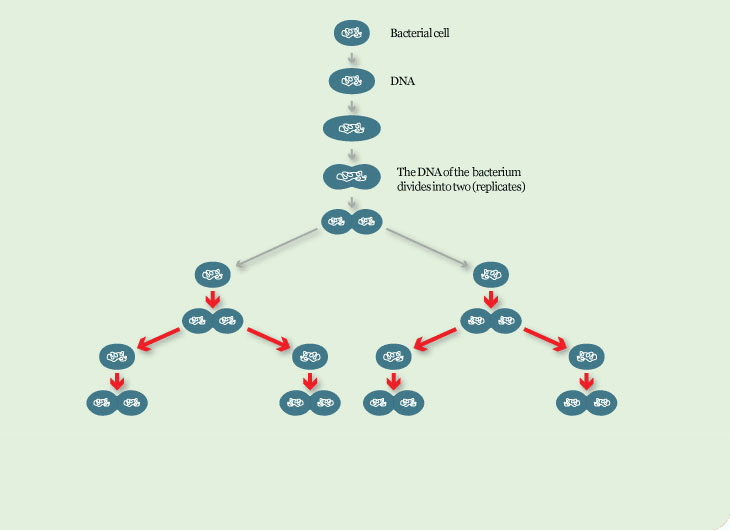 The plasmid often contains genes that give the bacterium some advantage over other bacteria. For example it may contain a gene that makes the bacterium resistant to a certain antibiotic. 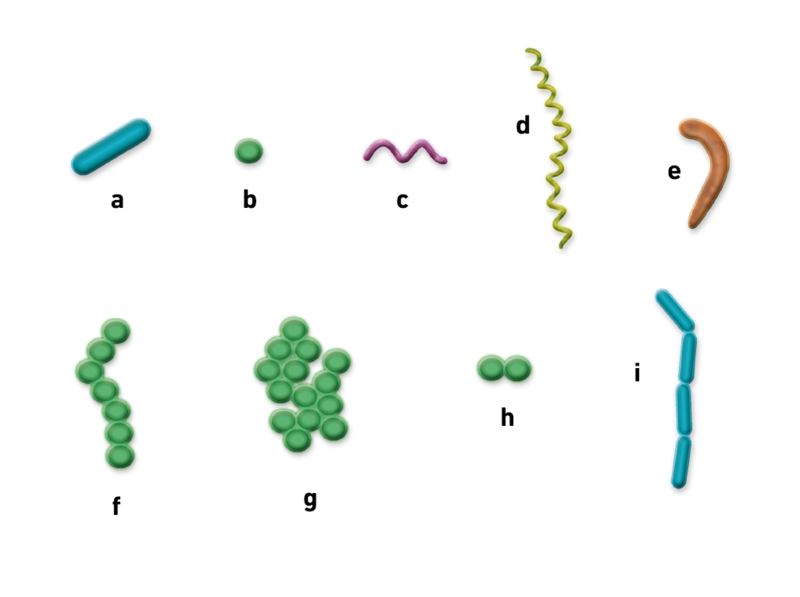 Bacteria are classified into 5 groups according to their basic shapes: spherical (cocci), rod (bacilli), spiral (spirilla), comma (vibrios) or corkscrew (spirochaetes). They can exist as single cells, in pairs, chains or clusters. 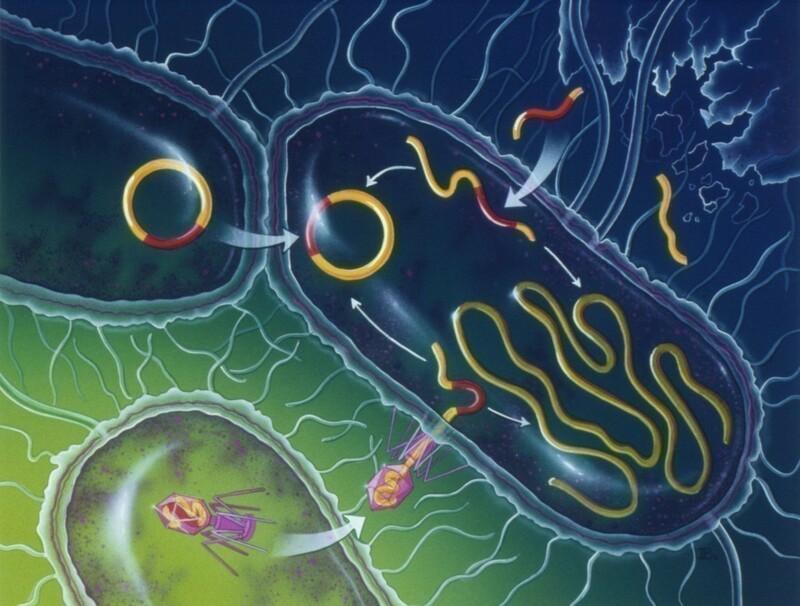 Artwork of bacterial cells becoming resistant to antibiotics. This resistance is acquired from a donor cell's plasmid (circular unit of deoxyribonucleic acid, DNA), which has resistance seen at upper left (red/yellow, red is resistance). Viral transmission involves a virus (pink, lower left) obtaining a resistant gene, and passing it to a bacterial cell that incorporates it into its plasmid. Bacterial cells also acquire segments of DNA released from dead cells (upper left). Mutations (not seen) may also occur, which may be antibiotic resistant and thus allow the bacteria to survive and reproduce. This bacterium causes anthrax in farm animals and less commonly in humans. Spores can survive for many years and are resistant to extremes of heat, cold and drying. This means in 8 hours, the number of bacteria will have risen to a colossal 16,777216! Bacteria are found in every habitat on Earth: soil, rock, oceans and even arctic snow. Some live in or on other organisms including plants and animals including humans. There are approximately 10 times as many bacterial cells as human cells in the human body. A lot of these bacterial cells are found lining the digestive system. Some bacteria live in the soil or on dead plant matter where they play an important role in the cycling of nutrients. Some types cause food spoilage and crop damage but others are incredibly useful in the production of fermented foods such as yoghurt and soy sauce. Relatively few bacteria are parasites or pathogens that cause disease in animals and plants. Bacteria reproduce by binary fission. In this process the bacterium, which is a single cell, divides into two identical daughter cells. Binary fission begins when the DNA of the bacterium divides into two (replicates). The bacterial cell then elongates and splits into two daughter cells each with identical DNA to the parent cell. Each daughter cell is a clone of the parent cell. When conditions are favourable such as the right temperature and nutrients are available, some bacteria like Escherichia coli can divide every 20 minutes. This means that in just 7 hours one bacterium can generate 2,097,152 bacteria. After one more hour the number of bacteria will have risen to a colossal 16,777,216. That’s why we can quickly become ill when pathogenic microbes invade our bodies. Some bacteria can form endospores. These are dormant structures, which are extremely resistant to hostile physical and chemical conditions such as heat, UV radiation and disinfectants. This makes destroying them very difficult. Many endospore-producing bacteria are nasty pathogens, for example Bacillus anthracis is the cause of anthrax.